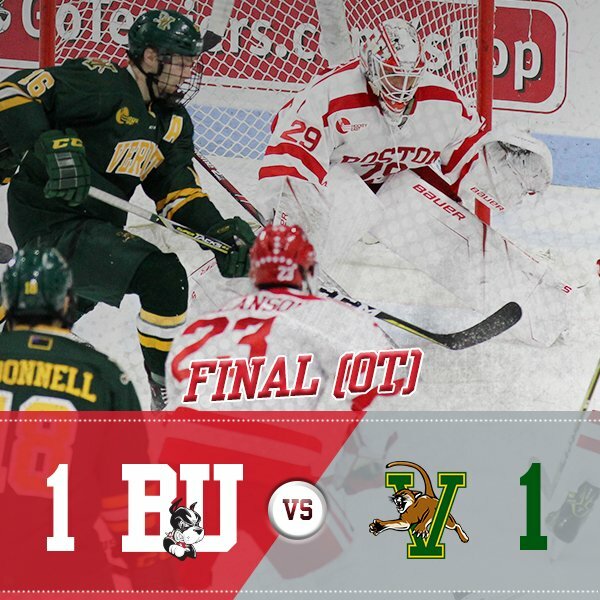 Terriers poured 34 shots on Vermont goalie Stefanos Lekkas but only produced one goal and had to settle for a 1-1 tie in the regular-season finale. Jordan Greenway’s first period goal held up until the opening minute of the third period when Alex Esposito scored on a power play to knot the score. BU finishes the season in fourth place and, following a first-round bye in the Hockey East playoffs, will host Connecticut in the best-of-three quarterfinals beginning March 9. Greenway’s goal at 18:44 came on a wrist shot from the high slot off a set-up by Brady Tkachuk. Kasper Kotkansalo also assisted. BU dominated the middle period with a 17-9 shot advantage with eight shots coming on power plays, but failed to beat Lekkas. At the end of the second period, Tkachuk took a five-minute major and a game misconduct for a hit to the head. The power play continued into the third period and just 38 seconds in, Esposito took a pass just below the right circle and beat Jake Oettinger for the equalizer. Oettinger finished the game with 28 saves. Bach gave BU an early lead with an unassisted score in the first period. Leslie and Compher ( a shorthander) extended the lead to 3-0 in the middle stanza. 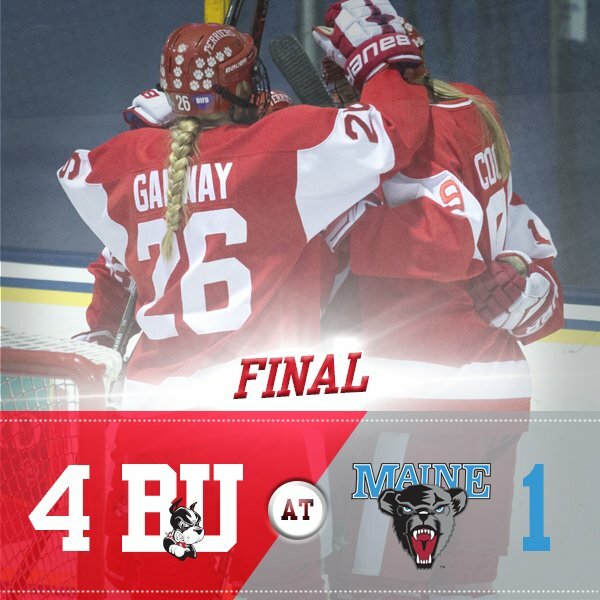 A Maine unassisted goal in the third narrowed the lead, but senior goalie Erin O’Neil stopped 10 Black Bear shots in the period, while Leslie’s empty-netter produced the final 4-1 score.